Grégoire Guillemin is an french illustrator specialized in graphic design and comic character illustrations. Artist Greg Guillemin, aka “Léon”, refuses to let his childhood passions fade quietly into the past. Science fiction, comic books, and video games still reign in his world. From 1930’s vintage to modern day Pop Art, his artworks rediscover and reinvent styles through experimentation with variegated, minimalistic techniques. 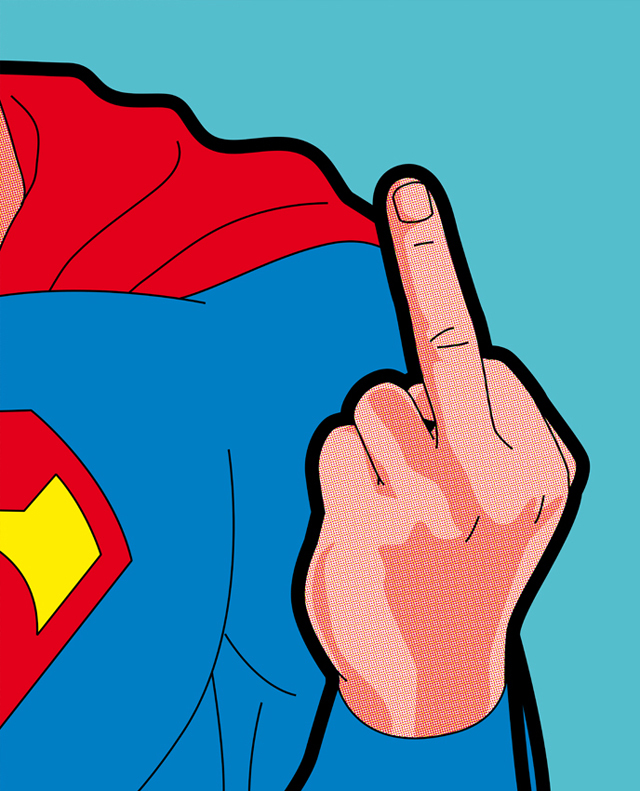 In his series of illustrations entitled “Secret Hero Life”, Grégoire Guillemin revisits the character design of several famous comic books heroes by drawing them in their inappropriate moments. While most get the impression that superheroes are perfect, in reality that is clearly not the case. Like everybody else, they do certain activities that “normal” people do throughout their day. Greg Guillemin’s imagination captures the day to day moments that don’t make it into the comic books. ‘The Secret Life Of Superheroes”, does a great job of illustrating everyday activities we don’t expect super heroes to ever really have to do. Inquire about prices to buy contemporary artist Greg Guillemin artworks, prints, paintings and other art for sale.